All my life I had imagined the stormy cape at the end of South America and the courageous mariners who had braved the crossing in sailing ships. I was determined to see it. Around 3:00 AM the motion of the ship jolted me awake. 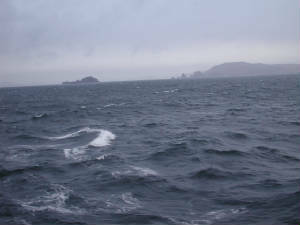 It was pitching so violently that I was sure we must be entering the infamous waters around Cape Horn. At 4:00 I got up, pulled on my warm expedition pants and parka and started to the main deck. As I lurched up the stairs the Filipino bartender caught up with me. I understood that he meant I should not try to go outside, and by this time I realized that he was right. Down in the forward lounge I helped myself to hot coffee and watched the spray dash against the windows. This was what rounding the Horn was supposed to be like! During the next hour more passengers straggled into the lounge. Someone had checked with the bridge and said we would reach Cape Horn at 5:00. The seas became a trifle more calm, and through the rain and mist we could make out the shape of a mountainous shore. I went to wake up Benny and pick up my camera, then headed for the forward deck. It was cold, wet, and windy, but with other dauntless travelers I stayed on deck and took pictures as the shoreline passed by. I finally found someone to take my picture too – looking wet and worse for wear, but grinning broadly because I was rounding the Horn! That day we sailed up the Beagle Channel under blue skies. The green mountains of Tierra del Fuego were lovely, but looking somehow soft and civilized after the rocks and glaciers of Antarctica. We had our final briefings and held an interactive discussion on The Antarctic Treaty and the impact of Antarctic Tourism. I was impressed by the environmental commitment of the expedition staff and pleased that they held a final presentation on the threat of longline fishing and the Save the Albatross Campaign, the environmental program that this expedition was pledged to support. We docked in Ushuaia around 5:00 PM, giving time for some passengers to dash ashore and check their e-mails at the nearby Internet cafes before the farewell cocktail and dinner. We would have one last night on board, then leave early in the morning on our separate ways. We had come to appreciate what a remarkable group of people had shared our voyage to Antarctica, the common bond being a passion for learning and a lifelong zest for travel. We had made friends with fellow passengers from Britain and Australia, Ireland and Denmark, Canada and Israel, Switzerland and Singapore. We had been brought together by the undeniable attraction of the great white continent, which we found to be a place of great peril and great beauty. We had learned that it is not only the coldest, the windiest, and the driest place on earth, but is also of vital importance to the rest of the planet, containing 95 per cent of the fresh water in the world and generating the currents that circulate our oceans. We had thrilled to the sightings of whales and seabirds and been shocked to learn how quickly their numbers had declined. And we had experienced the rare delight of standing in pure wilderness in a place where man had quite probably never gone before. As we left the ship the experience of Antarctica stayed with us along with a deeper understanding of our planet, the winds, the waters, and the web of life that connects us all. We knew we had become part of a privileged fellowship, the still small number of men and women who have crossed the Southern Ocean, forever to fall beneath the spell of the White Continent.